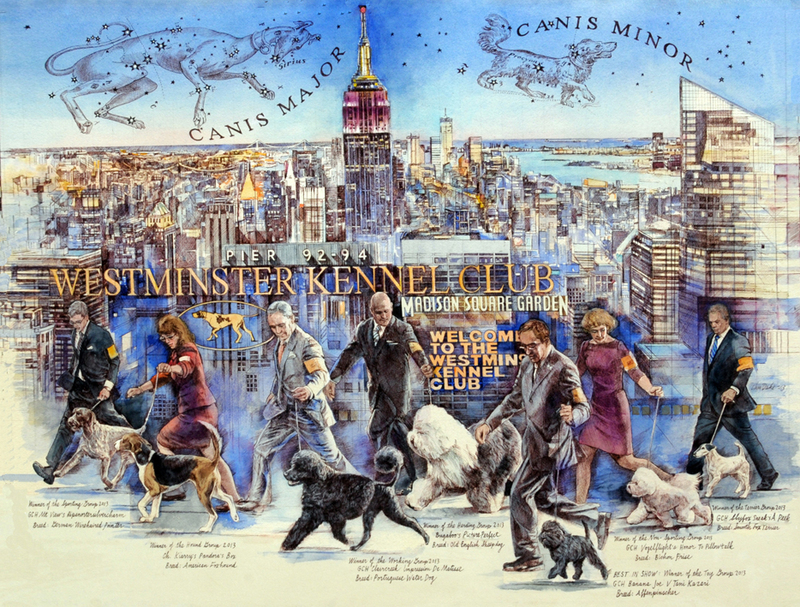 This piece, "Where the Stars Come Out," was chosen as the winning artwork in the 2014 Westminster Kennel Club Dog Show poster art competition. After attending the show in 2013, I had my own photos of the award-winning dogs with their handlers. These seven dogs were a perfect choice for the poster. I illustrated them as they ran their victory laps around the Madison Square Garden floor – an exhilarating moment emblematic of the show's spirit. In the sky I included Canis Major and Canis Minor, the starry companions to all earthbound dogs. In February 2014, I attended the Westminster Dog Show to sign prints of my artwork. It was a wonderful experience. Please see my News update to read more.